With such nice weather this week, our thoughts have been turning to the green meadows and woods, and this led us to think of Frances Griffiths and Elsie Wright, the young cousins who in 1917 discovered and photographed fairies inhabiting the stream near Elsie's mother's house in Cottingley, West Yorkshire. Some people say that the fairies in the famous Cottingley photographs were cut out from a book. We don't think the girls would have done anything as beastly as book breaking, and we wouldn't expect the fairy photographers of today to do it either. 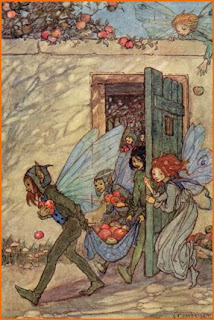 With that in mind, here are links to three images for you to print and cut out to arrange in your own fairy photographs. We think they would go nicely with the Gilded Fairy Chair we talked about on Monday. Oh, my god, I'm a book breaker! I have to have certain precious images in my line of sight daily to carry on! Thanks for these images. I want to make my own 2D 3D fairy tableau one day. Love, love, love that first image! Perhaps they have in mind 'borrowing' the fairy chair as well??? Shelley - I think I need to get you a gift card for Copy Central!! Dare Wright books go for between $150-300 now. Anyway - you are in good company - Ulla is a book breaker too!! I might be the worst of all because while I would never take apart a book I have sold scavenged parts - horrors of all horrors! I love the fairy pics you put up. They are fantastic. I must admit that I am addicted to fairytales and often buy books just for the images. P.S. Have you made any dolls lately?? The lovely Illustrations are by the English Illustrator Florence Harrison, she was born aboard a ship that her father captained in Australia, She is best known for her Illustrations to Christina Rosetti's "Goblin Market". but she was very prolific. Florence also wrote stories and poetry and all the lettering is hand drawn by her. she died in Sussex England in 1955.